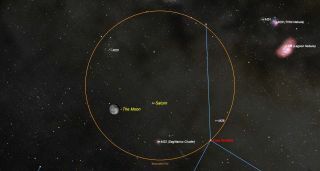 Saturn will appear near the moon in the night sky on May 31, 2018, as seen in this sky map by SkySafari. The planet of the moment is no doubt Mars, thanks to its impending closest approach to Earth since 2003, which will occur in late July. But there is another planet making an appearance in the late-evening sky that will likely attract its own share of admirers in the coming months: Saturn. If your weather is clear, you have a great chance to see Saturn in the sky late tonight (May 31). If you look up at 11 p.m. your local time, Saturn will appear just 2 degrees to the right of the moon (itself just two days past full). Remember: Your clenched fist at arm's length measures approximately 10 degrees of the night sky. But tonight, Saturn will be the closest and brightest object relative to the moon. How easy is that? Remember that the configuration you'll be looking at between Saturn and the moon is merely an illusion of perspective. Tonight, the moon is 251,200 miles (404,200 kilometers) from Earth, while Saturn is nearly 3,390 times farther away, at a distance of 851 million miles (1.37 billion km). It just happens that both will be closely aligned to our line of sight this evening. I don't know how many of you have had the chance to see Saturn through a telescope, but I'll tell you here and now that if you have not had that pleasure, it is an unforgettable sight. I've always enjoyed showing Saturn off to people who have never seen it through a telescope before, especially kids, who usually end up exclaiming words like "Awesome!" or "Wow!" Come to think of it, quite a few adults react in a similar manner! According to Murray Paulson, who edits the Planets section in the 2018 Observer's Handbook of the Royal Astronomical Society of Canada, "The rings are visible even in steadied (or image-stabilized) high-power binoculars and small spotting scopes." The northern face of Saturn's ring system is currently tilted 25.7 degrees to our line of sight from Earth. For really superb views, use a 4-inch telescope at 100 power or an 8-inch telescope at 200 power. For a really jaw-dropping view, try a 12-inch telescope at 300 power. Saturn's rings are believed to be composed primarily of billions of icy particles that range in size from tiny crystals to boulders. For the next several years, Saturn will appear at its best during the balmy summer season of the Northern Hemisphere. Saturn is currently located in the constellation Sagittarius, the archer. In the night sky, however, Sagittarius strongly resembles a conventional teapot, complete with a pointed lid, a protruding spout and a handle. Saturn currently sits just to the upper left of the lid. Saturn is becoming more prominent as the date of its opposition to the sun (which is June 27) approaches. Appearing to the unaided eye as a very bright (magnitude 0.2) yellowish-white "star" shining with a steady, sedate glow, it rises above the east-southeast horizon soon after 10 p.m. local daylight time and stands due south by around 2:45 the following morning. Among the 21 brightest stars, Saturn would rank eighth in brightness, between Rigel in Orion and Procyon in Canis Minor. A final note: Should unsettled weather hide Sunday's Saturn-moon pairing, they'll have another get-together less than a month from now, on June 27. That's also the night of Saturn's opposition, and the moon will be full. Editor's note:If you capture an amazing view of Saturn and the moon and would like to share it with Space.com for a story or image gallery, send comments and images to spacephotos@space.com. Joe Rao serves as an instructor and guest lecturer at New York's Hayden Planetarium. He writes about astronomy for Natural History magazine, the Farmer's Almanac and other publications, and he is also an on-camera meteorologist for Verizon Fios1 News, based in Rye Brook, New York.Follow us @Spacedotcom, Facebook and Google+. Original article on Space.com.